KIEV, Ukraine -- Seven and a half years ago, scenes of jubilant crowds celebrating the outcome of Ukraine's Orange Revolution -- a new presidential vote after a rigged election was annulled -- filled TV screens around the world. Viktor Yanukovych's camp regarded the 2010 victory as justice for what they believe was a stolen election in 2004. Now the country is back in the headlines, thanks to the controversial detention of former Prime Minister Yulia Tymoshenko, a heroine of the revolution, and threats to boycott next month's Euro 2012 soccer matches in response. 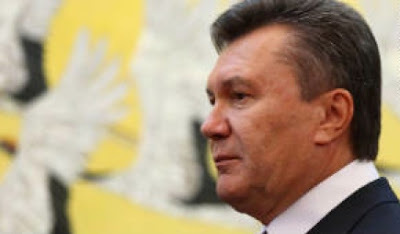 Viktor Yanukovych, the man defeated in 2004 by rival Viktor Yushchenko, is now president and stands accused by critics of persecuting his political opponents, Tymoshenko among them. And the promise of the 2004 Orange Revolution, where millions joined in peaceful protest against alleged corruption and in defense of democracy, is judged to have turned sour. And where will Ukraine, a country of some 46 million people sandwiched between Russia and Eastern Europe, go next? Key to Ukraine's future are its troubled relationships with Russia and Europe -- and the vexed question of its natural gas supply. And with parliamentary elections due this October, the pressure is on Yanukovych to do what it takes to keep his Party of Regions in power. Analysts agree that the seeds of Ukraine's current political disarray were sown soon after the pro-Western Orange Revolution swept Yushchenko and the glamorous Tymoshenko, famous for her blond braid, into power. "The Orange Revolution progressed Ukraine along the path of free elections and media pluralism," said Dr. Taras Kuzio, senior fellow for the Washington-based Johns Hopkins University School of Advanced International Relations. "It never really got to grips with the two more fundamental issues of rule of law and corruption." Yushchenko failed to deal with Soviet-style corruption in the judiciary, prosecutor's office and security services, said Kuzio, and "these institutions are now being used by counterrevolutionaries to basically take their revenge." The president and his prime minister, Tymoshenko, also failed to live up to their promises while in power. "The Orange Revolution was an unvarnished disappointment because they fell to squabbling and settling old scores almost as soon as they got into power, and the personality politics wrecked the whole government," said Nicholas Redman, senior fellow at the International Institute for Strategic Studies. "The vote for Yanukovych was a clear sign of the disappointment of unfulfilled promises from the Orange Revolution." When Yanukovych beat Tymoshenko in the 2010 presidential contest, he and his supporters believed it was justice after the 2004 election was, in their eyes, stolen from them, Kuzio said. But he won by a margin of only 3%, making the self-confident blonde, known for her fiery speeches, appear even more of a threat than before -- and Yanukovych more determined to consolidate power, Kuzio said. Last October, Tymoshenko was sentenced to seven years in prison after being convicted of abuse of authority over a natural gas deal negotiated with Russia in 2009. More criminal charges, including murder, are in the works and cases have also been filed against other opposition politicians. Many see Tymoshenko's imprisonment as motivated by political revenge and a desire to put the country's leading opposition figure out of the picture. The Ukrainian government denies that is the case, saying justice has been served. But her incarceration, followed by her decision to go on hunger strike to protest her medical care and an alleged beating in prison, have exposed how far the country still has to go to live up to Western expectations on justice and human rights. When German Chancellor Angela Merkel threatened to boycott the Euro 2012 matches to be played in Ukraine -- some in Kharkiv, where Tymoshenko is jailed -- in protest at her treatment, other European figures quickly followed suit. In another big embarrassment for Yanukovych, a summit of Central European leaders set to take place this month in Yalta, southern Ukraine, was called off after 13 of the 20 invited leaders threatened to boycott it, Kuzio said. And a so-called Association Agreement with the European Union -- which if signed would bring closer ties and economic benefits to Ukraine -- has been put on hold for as long as Tymoshenko remains in prison. All this leads to the question of what Yanukovych does next. The president is in a difficult position because any admission that Tymoshenko was jailed last October on trumped-up charges will threaten his own grip on power, Redman said. If he cannot turn to Europe, Yanukovych must look instead to Russia as an ally, unless he wants Ukraine to wither in isolation. But although commonly described as pro-Moscow, Yanukovych is better considered as first of all pro-Ukraine, analysts say, and ties to Moscow are fraught with their own risks to his homeland. At the heart of Ukraine's relationship with Russia are its former status as part of the Soviet Union and the reliance of its industrial sector on Russia's vast reserves of natural gas, said Dr. Igor Sutyagin, a research fellow in Russian studies at the Royal United Services Institute, a London-based think tank. People in Ukraine, which became independent in 1991, want to feel separate from Russia and dislike the perception that they are in Moscow's pocket, Sutyagin said. But leaders in the Kremlin are keen to keep Ukraine within Russia's sphere of influence -- and one way to keep it in line is through the control of natural gas supplies, a perennial source of conflict between the two countries. Much of the natural gas supply of Eastern Europe flows through Ukrainian-owned pipelines from Russia's Gazprom, leading to fury in Europe in 2006 and 2009 when Moscow shut off supplies in the height of winter during contract battles with Ukraine. At the time the gas deal was signed by Tymoshenko and Russia's Vladimir Putin in 2009, tensions between all parties were high and a resolution to the crisis was urgently needed. With hindsight, Tymoshenko did not strike a great deal for Ukraine, analysts say, but that is partly to do with market fluctuations, and they consider it should be seen as a political error, not a criminal offense. Nonetheless, the price had steadily climbed by the time Yanukovych was elected and the country's industry was feeling the pain. In Ukraine, business and politics are closely intertwined, said Sutyagin, and Yanukovych's political support base is in the energy-hungry industrial east of the country, which tends to look more to Russia and where its fertilizer and aluminum businesses are centered. Soon after taking office, Yanukovych signed a treaty with Moscow that extended its right to use Ukraine's Black Sea ports for an additional 25 years, until 2042, in return for a renegotiated deal on natural gas imports that knocked $100 per thousand cubic meters off the price. The ports, on the Crimean Peninsula, are strategically useful to Russia's navy but more importantly hold symbolic significance for the Kremlin, which sets great store in military power, said Sutyagin. "It's still very difficult for the Russian ruling elite to recognize that Ukraine is finally independent," Sutyagin added, and Moscow still tries to take a "big brother" role toward its neighbor. Russia is also pressing Ukraine to join a "customs union," involving Russia, Belarus and Kazakhstan, rather than pursue closer links with Europe. But in the longer term, Ukraine is playing a hand of diminishing strength in international terms, said Redman. Although Kiev is seeking to exploit recently discovered shale gas reserves in a bid to lessen its dependence on Russia, Moscow is investing in alternative transit routes for its oil and gas to reach Europe. That would mean Ukraine no longer has the bargaining chip of its gas pipeline to use in negotiations with its powerful neighbor. Meanwhile, the controversy over Tymoshenko's alleged abuse in prison, with images of her bruised body seen around the world, has given opponents of greater Ukrainian integration within Europe plenty of ammunition, said Redman. "Yanukovych's desire to consolidate his grip on power and to ensure that power does not transfer back to anyone else -- that Tymoshenko doesn't get a second bite of the cherry -- has in effect closed off the Western option, but he refuses to see it," Redman said. In domestic terms, Yanukovych's rolling back of democracy since gaining power and the incarceration of Tymoshenko has boosted popular support for her and her party, Kuzio said. This could lead to pain at the polls for Yanukovych in October -- if free elections are held -- and make a humiliating boycott of the Euro 2012 tournament in Ukraine just the start of the president's woes.